With the arrival of our new English teacher Danía came an explosion of new English courses, including a free after school English program for the local kids. It started out as a huge success, with almost 10 kids from the barrio (neighborhood) attending the first week of classes. 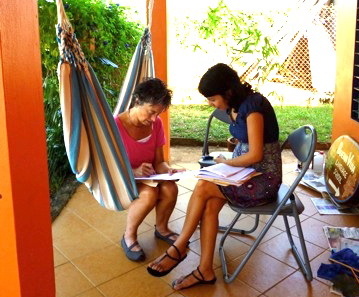 Living in a rural part of Panama as a foreigner, part of the charm is that there aren’t many English speakers. 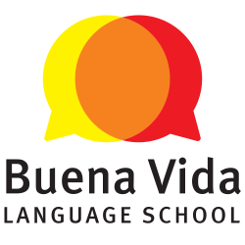 It creates a perfect environment for learning Spanish. Estimates on the percentage of Panamanians who speak English are anywhere from 14-18%, and it’s safe to say that the grand majority of them live in or around Panama City. Despite the obvious advantage for foreigners who study Spanish here, for the locals the benefits of speaking English as a second language are undeniable. It opens many doors for opportunities to study and work abroad, or even to get a higher paying job locally. Hence ‘English for Kids’ was created, our after school program of kids of all ages to learn, play, and have fun in English. 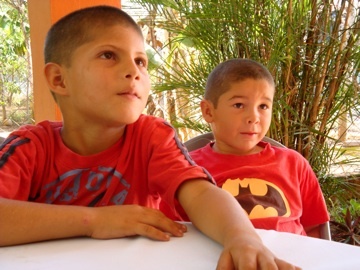 The goal was to create the program, and get it ready for volunteers to step in and help with the classes or even take over teaching the classes during their time in Pedasí. So, COME AND VOLUNTEER! The after school program is every Tuesday and Thursday at 4 pm.